So I have blogged Se7en Free Outings in Cape town and Se7en Budget Outings in Cape Town and the time has come to do a post on Se7en Priceless Outings in Cape Town… Turns out a lot of the outings in Cape Town that we would visit if we were visiting Cape Town on holiday are the ones that are really quite pricey for a local family!!! If we were visiting Cape Two we would definitely visit these spots but since we do live here they are just out of reach!!! 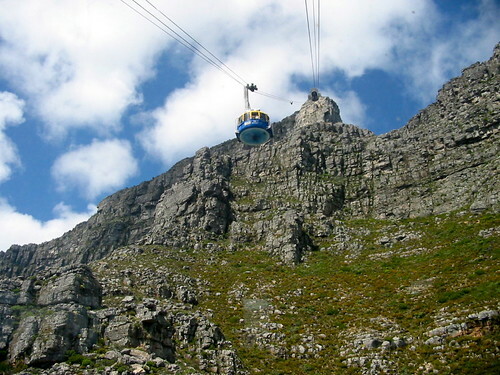 The Cable Way: We haven’t done this for years… but it is so much fun to get to the top of Table mountain and see forever. If you are lucky enough to get this outing on a windless day then the whole experience is just totally awesome!!! I think I may have to go in to training and walk to the top with my kids… since we haven’t been in about nine years maybe we should get on our marching boots and practice, practice, practice!!! 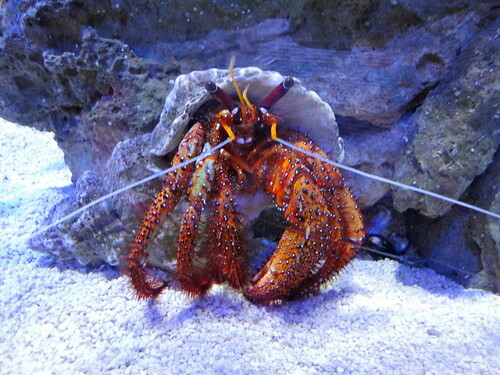 The Two Oceans Aquarium: This is a fantastic outing that we would love to go on… but for a family of ten it gets somewhat pricey!!! My older kids have been and loved it, in fact the oldest two just did a fantastic holiday workshop there and have come home much more environmentally aware and they have a new found fascination of everything under the sea!!! The aquarium is a fantastic outing if you can get there then get there… because it is a living exhibition you never see the same thing twice. There are great area for kids to touch and get involved and their holiday crafts are fantastic. If you live in Cape Town you can become a Soulmate, which is the option to buy an annual entry ticket… the ticket is about the price or just over the price of two visits to the aquarium so if you see yourself wanting to visit again and again and I know I would, then it is well worth considering. 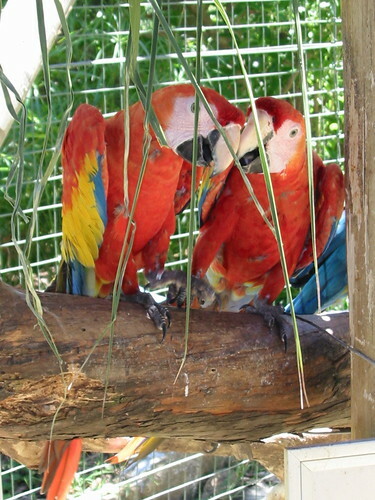 The World of Birds: I have taken my kids here a couple of times – in the past when we had just a handful of kids!!! It is a great outing… and expect to spend much longer there than you planned for!!! It takes a long time to get through all the wonderful birds that are on offer. When we have been I pack tons of snacks and sketch books and we stop at lots of benches along the “walk-through-route” to talk about what we have seen and to create mini-breaks, otherwise it can become quite long winded and intense. 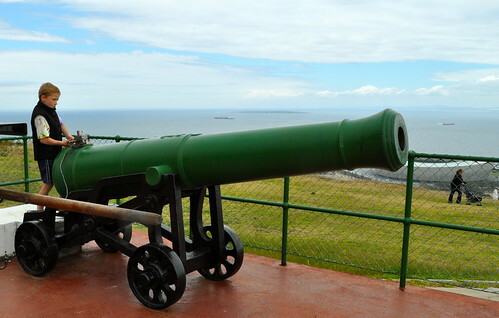 Robben Island: There it is behind The Noon Day Gun. 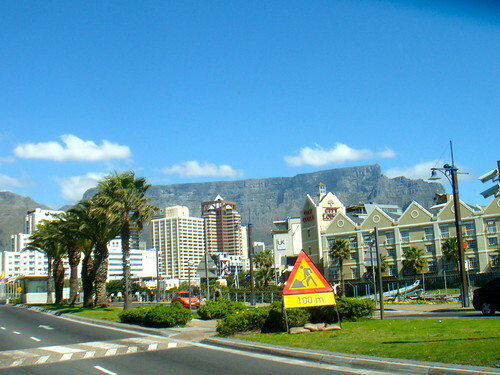 To See the Robben Island Museum you take a ferry from The Nelson Mandela Gateway at the Waterfront. It is a World Heritage site, where you can take a tour of the prison that housed Nelson Mandela and learn about the history of South Africa. I would love take a family outing to go and check this site out!!! 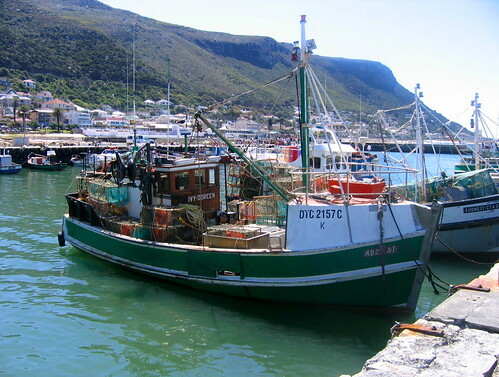 Mellow Yellow Water Taxi: This is a little yellow boat that takes you from one of our favorite places, Kalk Bay, across the bay to Simonstown… My kids are all dying to do this when they see that little yellow taxi scoot past there eyes all fly out on stalks!!! High Tea at the Table Bay Hotel: You can get High Tea at a number of tip top restaurants in Cape Town,, but having just reviewed Justin Bonello’s “Cooked Out of the Frying Pan” we would love to try out the Table Bay Hotel!!! Anywhere that serves a chocolate cake coated with a kilogram of melted Lindt ganache must be worth a visit!!! Seriously!!! 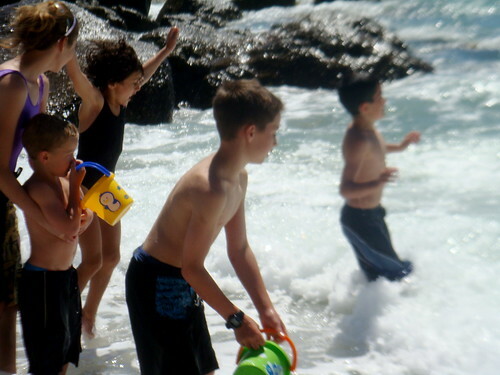 Gary’s Surf School: I have a couple of kids who would so love to go to Gary’s Surf School and master the art. I have a feeling that if you grow up in Cape Town you can’t help learning to surf at some stage. Huey Helicopter Tour: Okay to dream big!!! In my life before kids I had the opportunity to go on a couple of helicopter rides when traveling in the Southern Ocean… well it gave me a taste for it and I have never been in a Bell Huey but I love the distinctive sound!!! Yes a quick tour would suite me very well!!! 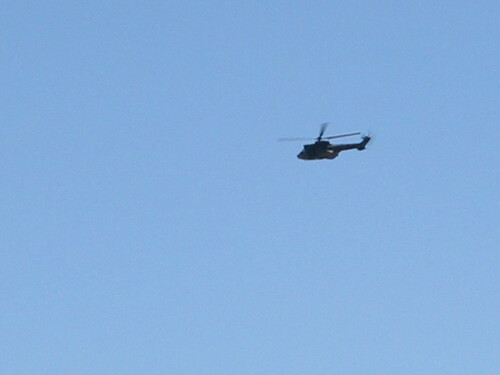 I have another one for you – every so often there is this crazy loud low flying fighter jet over Kommetjie. Well, I recently found out it is a high speed sight seeing fly-over from Cape Town – R20 000 a go!!!! Guess we should start saving! Hay Jacki!!! I am not going to even mention that to my kids – they will all want a turn and times that by ten and we could add an extra “wing” to our house!!! We will chat much later…. go outdoors and have some fun in all the snow – it is too windy here to step out of the door… Lots of love.